This was recognised on November 7, 2006, when the Irish Government through An Post (The Irish Postal Body),honoured Altan by issuing a postal stamp featuring the band. This award showed Altan’s immense impact on recent Irish culture at home and abroad and the growing popularity of Irish traditional music generally. Co. Donegal has a strong fiddling tradition from which Mairéad Ní Mhaonaigh and Ciaran Tourish get their inspiration and unique repertoire. Mairéad is also from the Gaeltacht area of Gaoth Dobhair(A Gaelic speaking region) where she learned many of the songs which Altan have recorded over the years. 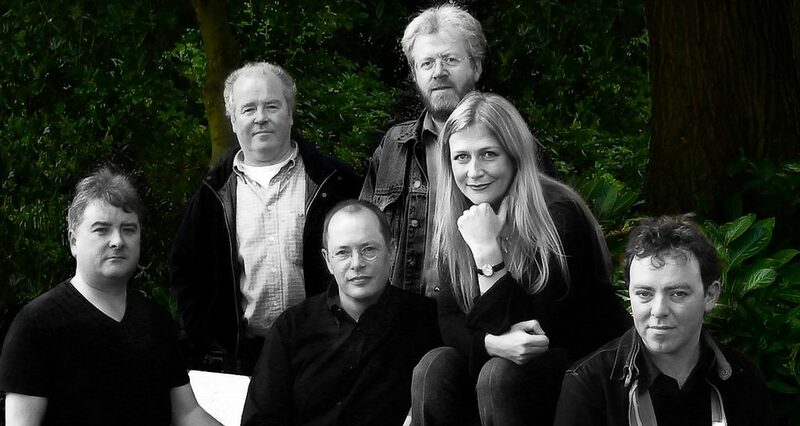 Altan have been touring consistently since their genesis in the early eighties, when Mairéad and her late husband ,Belfast flute player ,Frankie Kennedy decided to leave their teaching jobs and pursue a career in music and tour the world with their friends. With members Mark Kelly (guitar),Ciaran Curran(bouzouki). Daithí Sproule(guitar) Ciaran Tourish(fiddle, whistles) and past members Paul O’Shaughnessy(fiddle) and Dermot Byrne(accordion0 and latest member Martin Tourish (accordion), Altan have been to the forefront of traditional Irish music worldwide. Altan have always approached their music and arrangements with integrity and openness and have strived to share their culture to new expanding audiances worldwide. On this new recording , “The Widening Gyre” their spiral of music expands , envelopes and includes friends and music that they have met on the road over their 30 years of touring professionally. For this recording. during the summer of 2014 ,Altan went to the hub of country music, Nashville in Tennessee .There ,they set up camp in Compass Records own studios and co-produced this album with their friend Garry West of Compass Records and engineer Sean Sullivan. They wanted to try a new, fresh approach to recording and reflect how they have widened their musical horizons over their career and with the help of Garry produced “The Widening Gyre”, the title being a reference from W.B.Yeat’s poem ‘The Second Coming’. Over their time there, they invited and collaborated with their long time musical friends Tim O’Brien, Alison Brown, Darol Anger, Jerry Douglas, Jim Higgins. Bruce Molsky,Tod Phillips, Mary Chapin Carpenter, Natalie Haas, Garry West, Julee Glaub Weems, Kenny Malone, Mike McGoldrick, Eddi Reader,and Stuart Duncan. They jammed and recorded in the studio and produced tracks that spontaneously evolved as they chatted over coffee.Tracks like Buffalo Gals, Leather Britches and Leslie’s Reels; Thomasino. Some song suggestions came about the same way, songs like Gypsy Davey which is a version of the House Carpenter and No Ash Will Burn, has led to a very different recording from Altan but which still retains their roots in Irish Traditional music.